Isaiah Thomas was there when the Celtics needed him, and had he never appeared in Boston, the team may not look as good as it does right now. The Celtics owe Isaiah a debt of gratitude. He came to the Celtics via trade in February of 2015 and immediately had a major impact. He averaged 19.0 PPG in his first season in Boston - 22.2 PPG in his second season - and 28.9 PPG and 5.9 APG, while shooting 46% from the field in his final year here. He was a major reason that the Celtics got into the playoffs all three seasons that he was part of the team, and he put the team on his shoulders when he took them to the Eastern Conference Finals in 2017. His super-human performance in Game Two against Washington that year is the stuff of legends. Isaiah Thomas has agreed to a one-year, $2 million minimum deal to join the Nuggets. It will be his third team since being traded from Boston in the Kyrie Irving deal at the end of last August, but his fingerprints are still on the Celtics. Had Thomas not come to the C’s in February 2015, dragged them into the playoffs that year and led them from 40 wins that season to 48 and 53 in the ones that followed, the Celts may never have been viewed as attractive enough to free agents. Maybe Al Horford and Gordon Hayward come anyway, but they would have been looking at a far less successful club and had to take a far greater leap of faith. And Isaiah was obviously a big part in getting Irving, even though injuries and other team issues made it a poor fit for him in Cleveland. “He entertained our fans. He competed at a very high level. He was tough as nails, and he was a big-time fourth-quarter guy,” said Ainge. “He brought a lot of electricity and excitement to the Garden. 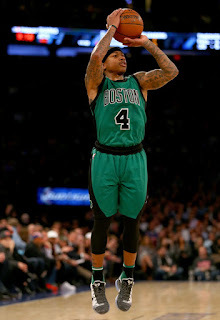 “Isaiah added credibility to our team by making us a legitimate basketball team,” Ainge told the Herald yesterday. “And on top of that he was very entertaining. So Isaiah is back with his former Coach, Mike Malone, on a vet-minimum 2 million deal. That had to be difficult for him to accept after being so verbal about being a max player, but it does give him the chance to resurrect his career after injury, surgery and just plain bad luck. 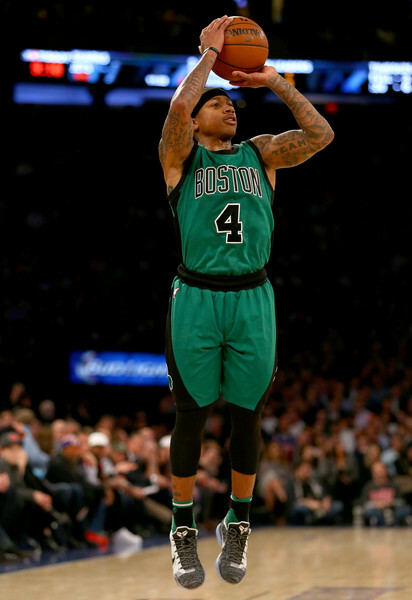 Isaiah used his lack of height to his advantage to lift the Celtics offense to credibility, quickly moving under and around bigger, slower defenders. Unfortunately, that short stature hampered him on the defensive end and could not be overcome. Put those skills and that heart in a Terry Rozier-type body, and Isaiah may have remained a Celtic. Regardless, his presence here lifted the team at a critical time, and his influence is still seen and felt to this day. We owe the man a tribute.